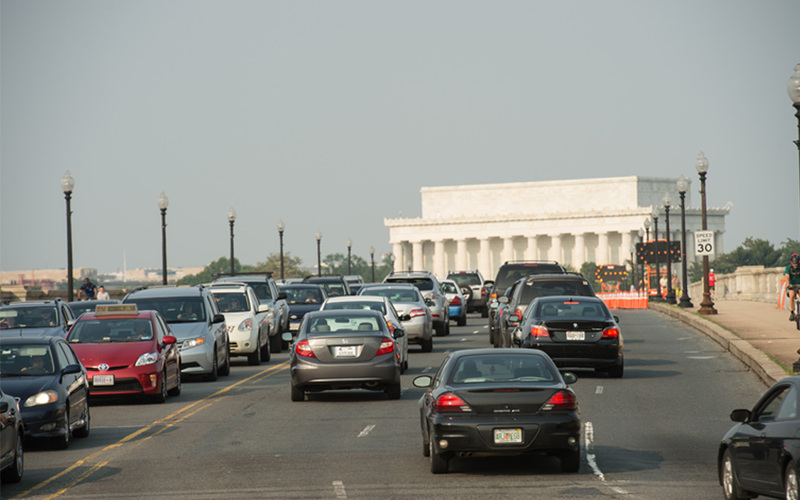 Four construction firms submitted bids June 18 to repair the troubled Arlington Memorial Bridge, a major artery over the Potomac River in Washington, D.C., which has become a symbol of what happens when the nation fails to invest in infrastructure. The National Park Service, which owns the 1930s-era span, closed two lanes in May and moved up the bid deadline for repairs first called to attention in an April 2013 inspection report. On June 22, the Park Service began enforcing a new 10-ton weight limit on the bridge after giving tour bus operators and other heavy vehicle owners a few weeks to find new routes between the District and Arlington, Virginia. The impact on tourism and traffic wasn’t immediately clear. Rep. Eleanor Holmes Norton (D-D.C.) said the bridge “has been crumbling in plain sight of the Congress for years,” but that even the partial closure may not be enough to spur action. “It is going to take public outrage, perhaps like what is expected from the domino effect of a partial shutdown of a major gateway bridge,” she said. The latest engineering estimate from the Federal Highway Administration (FHWA) for the repairs suggest the work will take seven months to complete at a cost of more than $3.6 million. The work includes structural concrete, steel, and timber member repair or replacement, installation of additional elastomeric bearing pads, expansion joint repair or replacement, debris removal from bascule span truss members, trunnion posts, and the bottom of the trunnion areas. The roadway work includes concrete sidewalk repairs, drainage improvements and ultra-thin bonded asphalt overlay. The four firms submitting bids were Cianbro Corp. of Pittsfield, Maine; Martins Construction Corp. of Falls Church, Virginia; Kiewit of Arlington, Virginia; and Fort Myer Construction Corp. of Washington, D.C. The bids are being reviewed by FHWA. “We anticipate awarding a contract within the next few weeks,” an FHWA spokesman said in a June 23 email to ARTBA.